Last few months have been crazy, to say the least. Running around, screaming and shouting at a malfunctioning laptop, a highly erratic schedule when it comes to life in general and almost everyday an alarm or a shout of concern from someone or the other online. Maintaining sanity has been a tough task. I must admit. But it has been sorted slightly better because we can always identify a simple pattern to things. What requires attention, who needs immediate ear and more importantly what input should flow back into the system. Running a now ever growing blogging community, these patterns are becoming increasingly critical in surviving each day. Intent as a pattern speaks volumes. It shows when no words are mentioned. It screams when silence has a dead pan expression. Intent and not intellect run communities. A few days back I was speaking to someone on phone. And we were having a candid discussion over blogging groups/communities. An aspect of it was of course the idea to read each other regularly. The person on the other side had certain inhibitions. She felt that she often wonders how to read someone she does not even understand. I took a pause and explained it through an example. Which I will recreate here for you. Communities are like families. We decide to support someone as a family member not only because we believe in their idea but because we believe more in the bond we share. We may not understand why a certain cousin wants to start a car driving school portal but by the virtue of our emotion to see him grow, we support him. And we do not misguide him. We are always offering supportive critique, getting our contacts to put in favors and spending endless four am calls to make things work for him. Community is like family. You may not understand a blogpost but so much of a bloggers day depends on your single comment and share. I recall when I had decided to start newsletters, I had the entire thirty WT members support me. Not only through subscriptions but also sharing. How many even supported the idea, I do not know. Because they never put this question out there. For them I was a tribe member and by virtue of it they had to support me. Result? I today have 1500 subscribers. And in addition faith that I will always have a tribe. All of this cannot work or happen until the intent of a group is right. Why all of this fails to work in light of self-centered outlook or ulterior motives is because intent is not word specific. One always knows what is the emotion on the other side. And I have seen it so many times. Groups do not work because only a few of them do not have the intent to make it so. Blogging is so much like life. Insecurity, bad intent and vicious emotions never get hidden behind a blogpost. They get revealed always. 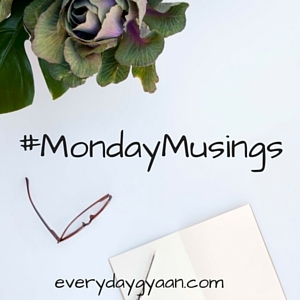 This week I’m co-hosting #MondayMusings with Corinne of Everyday Gyaan today. I started reading it because of the picture you have used but a paragraph ito your post i realized how it even applies to real life and that relationships -friends or family all run on intent.i thoroughly enjoyed it. Winderful post .. and #blogchatter is my first community with people i havent met yet. But its about blogging which i love the most, my passion towards it have made me get involved.. And i am liking it. As per my thinking .. Communities will make you learn how others think and what needs to be done in every repect, it provides enough motivation to keep doing your thing. Finally Intent has to be there, no one will succeed in anything without proper intent. Write Tribe was the first blogging community I joined. To start with, last year, I was one of the very few bloggers there who blogged about parenting and motherhood. Still, I found myself heard and my blog posts read. This was highly encouraging for me. I have huge respect for Corinne and you, in the way both of you manage the blogging communities – Write Tribe and Blog chatter. I do understand it requires a lot of commitment, perseverance and hard work. You know how strongly I feel about community, Richa. And despite some bad experiences, I do feel it can work if we want it to. Intent – that’s a powerful word! Yes Vikram a strong community can benefit another community such as nation or sports as a stream…. Wonderful post. I belong to several online communities, groups, blogshares. I believe it is important to always support those members even if I don’t fully understand what they are doing or writing. As you said, just a kind comment can make a world of difference. Have a great week! Thanks Lori 🙂 Glad you liked it ! I, too, believe that blogging communities are like a big, inspiring, happy, and diverse family. I am happy to be a part of this ever-increasing family. Communities are indeed helpful in making us better for there is a lot to learn from each member of the community and we know that there will be support group on which we can bank upon. Communities have really helped me blog better! I love the feeling I get from being part of a blogging community. The give and take, the support. I enjoy reading blogs and commenting on them too. thanks for sharing. No initiatives, no energy is what troubles me. It took me a Blogchatter session to truly understand the need of a blogging community, of being a part of one and supporting the other members. Reading this post has only strengthened my resolve to share feedback. I started taking blogging only after I joined in a community. And that connection brought me to where I am now. See meera that happens as well! Immediate Society is the pedestal which rolls for us.Nicely worded. I have been a part of a few blogging communities and must say that it’s been a lovely experience understanding the views and interacting with bloggers from different walks of life. These experiences surely play a part in making one a better blogger.